If you have a simple haircut, you may be able to trim your own hair between salon visits, which will save you time and money. Simple haircuts include one-length cuts and long layers, a style in which all of the hair is combed upward to the same location and bluntly cut. Short layers, a style in which the hair is pulled straight out from the scalp and cut the same length from the scalp all over the head, can sometimes be trimmed by someone with a little experience as well. Cuts that use multiple cutting tools or incorporate geometric designs and multiple elevations of cuts should be avoided by a novice. Wet the hair using the spray bottle. Comb through the hair to remove tangles. Part the hair where it likes to separate naturally, and comb the hair straight down on either side of the part and in the back as well. Tilt the heat downward and comb the back of the hair straight down, making sure it is not entangled around clothing, jewelry or the ears. Carve out a 1-inch section at the center of the head. Comb the section down, and hold it between the first two fingers of your left hand. Snip the ends of the hair. Move to the left of the section. Carve out another section, and hold it between your fingers along with the previously cut section. Use the previously cut section as a guide, and trim the hair even with it. Repeat until you have worked your way to the front of the hair. Move back to the back center of the head, and repeat for the other side. Dampen the hair with water from the spray bottle, and detangle the hair with the comb. Part the hair at the natural part. Carve out a 1-inch section of hair, running from the crown of the head to the nape of the neck. Comb all of the hair in the section straight up toward the ceiling. Clamp the hair with the first two fingers of your left hand, close to the ends of the hair. Snip the ends. Move to the left of the section, and create another 1-inch section. Comb the new section and the previously cut section straight up. Trim the ends of the new section even with the old section. Move around both sides of the head in a like manner. Wet the hair down, then comb through it to remove tangles. Hold the hair straight out from the scalp in small sections measuring 1/2 inch by 2 inches. Carve out the first section, and clamp it between your first two fingers, close to the ends of the hair. Snip the ends. Carve out another section directly adjacent to the previously cut section. Use the already cut section as a guide, and cut the new section even with it. Continue until all of the hair on the head has been trimmed. Use haircutting shears rather than common household scissors. 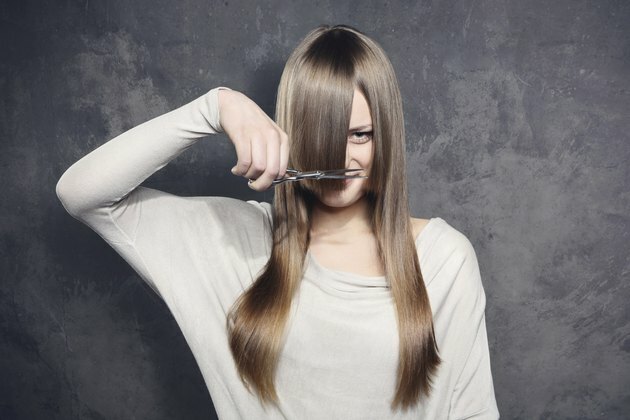 Household scissors can gnaw the ends of the hair, resulting in split ends.